Before the snow even finished melting away for the summer months, I headed out and into the backcountry for an overnight adventure. With a three-day weekend, like Memorial Day, it couldn’t be wasted on the couch, so I packed my new Black Diamond backpack, grabbed the tent, and spent some much needed time with nature (and an awesome group of friends!). 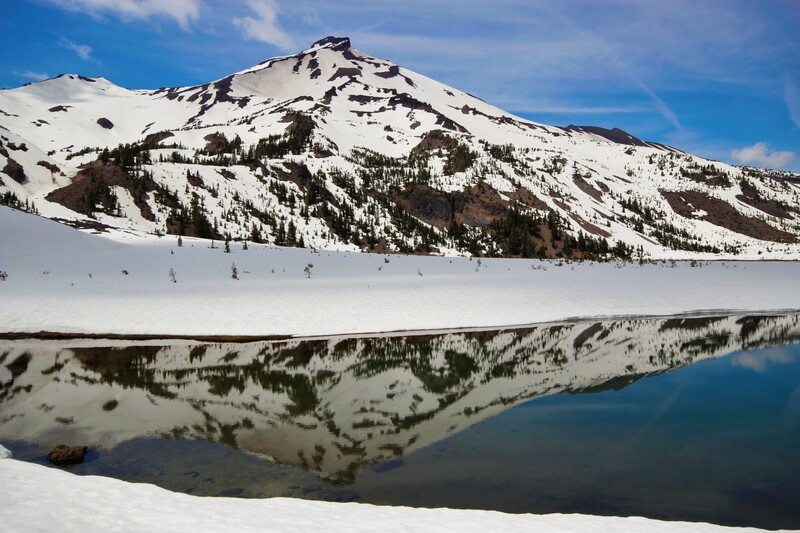 A really popular trail in the summer time, the Green Lake Trail starts from the Cascade Lakes Highway and meanders for 4.2 miles along Falls Creek to alpine lakes and meadows at the base of South Sister and Broken Top. Hiking through the snow for the last two miles of the trail Saturday afternoon, we finally set up our tents in a melted-patch near a few trees just a half-mile form the lake as the sun started to set. Our home for the next two days. While I typically am go-go-go-getter and want to hike miles on end, this time around, we decided to take it slow. Soaking up the sun after a cold night, we hiked to Green Lake, which was still mostly frozen, filtered some water for dinner, and hung out in the hammocks for the afternoon on Sunday. It was a lovely way to spend the day. But after two nights with temperatures dropping down into the 30s, we were ready to head home come Monday. So after a leisurely breakfast, we loaded up our bags once again and headed back to the trail. I loved this trail because of its simplicity, beauty and peaceful nature.